B3's national survey was released in September 2014. Our initial goal was to explore generational similarities and differences and, thereby, change the conversation about aging and Boomer engagement. As we dove into the results, we encountered issues that shed light on challenges facing the Jewish community's sustainability. In a landscape characterized by a dizzying rate of change and countless ways to connect and gain access to information, activities, organizations, and like-minded people, terms like affiliation, membership, and community take on new meaning. Explore these issues--and our recommendations--in this report and share your response using the dialog box on the home page. In this episode of the Seekers of Meaning Podcast, the guest is Stuart Himmelfarb, co-founder of B3/The Jewish Boomer Platform, discussing how to engage baby boomers in Jewish life. 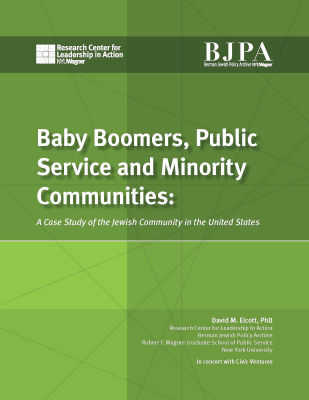 David Elcott conducted the first national survey and analysis of Jewish Boomers and encore careers. Its findings provided the impetus for creating B3. This article, co-written by David Elcott and Stuart Himmelfarb, appeared in eJewishPhilanthropy on May 23, 2011. It addresses the trends affecting Boomers and intergenerational issues, as well as the challenge in getting these issues onto the agenda of local communities and funders. This article appeared in the July 1, 2011, issue of The Jewish Week and was co-written by David Elcott and Stuart Himmelfarb. It reviews the current communal and organizational landscape, and the challenge of creating new models of engagement that respond to new trends affecting Boomers and related intergenerational issues. Audrey Lichter, "The Coming Boom"
Read an article by our friend and colleague, Audrey Lichter, executive director of Chai Mitzvah, which passionately argues for including Boomers and others who are older than "next gen" in our planning and programs. Move Over Millennials: Engaging young adults is important, but what about everyone else? 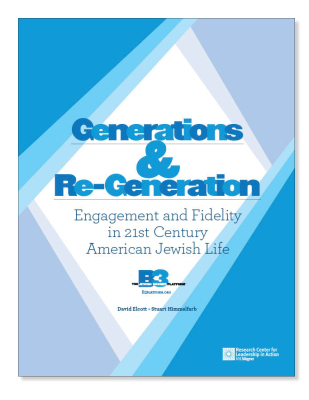 Gary Rosenblatt's column in the March 21, 2014, issue of The Jewish Week deals with an issue at the core of B3's work by recognizing that we need to expand the Jewish community’s focus and funding beyond “next gen” to other age cohorts, including Boomers. Excellent article by Leisah Woldoff, Managing Editor, including this excerpt: “We’re seeing the beginnings of recognition that not only [are boomers] a population that’s worth engaging but [they also] are a population that might just drift away,” Himmelfarb said. It’s not necessarily a mass exodus of boomers running from the Jewish community, he explained, but more of a subtle drift away as they look for interesting things to do with their newly available time and desire to establish their legacy.